GUNNISON, Colo. – The Gunnison Cattlemen’s Days Tough Enough to Wear Pink campaign has provided an impact on the local community, but it touches people well beyond the Gunnison Valley. “I think they do amazing work,” said James Otto, one of the artists who was part of the TETWP Songwriter Concert and Auction on Tuesday, July 10, in Mt. Crested Butte. “They are giving back in a way to find a way to help folks who are going through the toughest points in their lives. Otto shared the stage with legendary songwriter Dean Dillon, who serves on the TETWP board and helps organize the organization’s largest annual fundraiser, and Easton Corbin, a last-minute replacement for an ill Tyler Farr. “It was a great event,” Corbin said. “My buddy, Tyler Far, got sick. Our manager called me and told me what the event was, so I was happy to come. 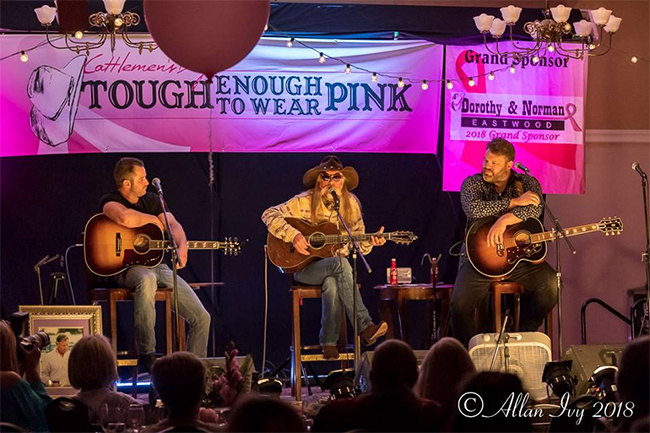 This year’s concert and auction raised more than $340,000, said Heidi Sherratt Bogart, executive director of Cattlemen’s Days Tough Enough to Wear Pink. Over the 13 years the organization has been in existence, it has raised more than $2.6 million, all of which is used locally. That made it fairly easy for the country artists to join Dillon on stage. “My family has a long history with breast cancer,” Otto said. “My grandmother had breast cancer and ended up passing away after battling it for a long time. My mom has been through breast cancer; she is a survivor. My mother-in-law just this last year went through stage 3 breast cancer. It’s something that means a lot to me. That mindset, along with the giving of so many special donors that take part in the concert and auction every year, has been big for the local TETWP community.